On November 23rd 2018, the day which so many of our students anxiously expected, finally arrived. 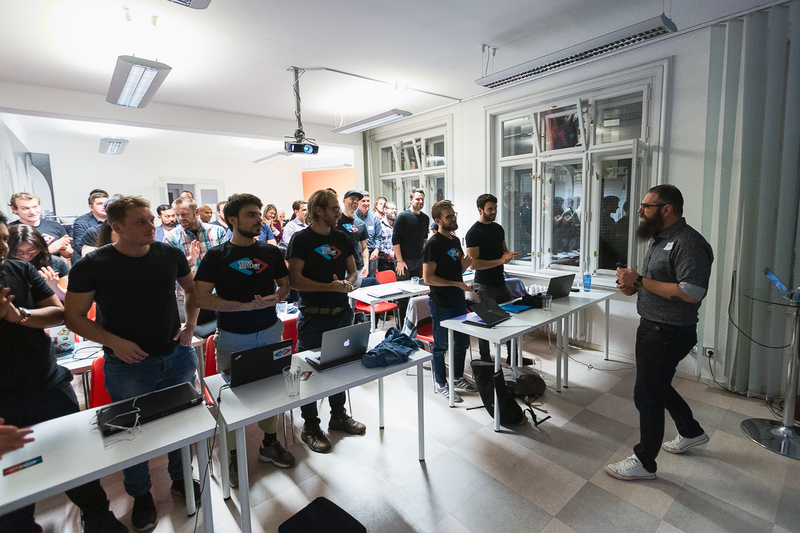 Demo Day, where our students present their final projects, took place at the Prague Startup Centre. All the teams have worked hard during the previous months to fully understand the patterns of programming and to implement all the newly obtained information into their interesting projects. They had to turn their ideas and thoughts into reality in the form of a product with practical use, such as ScratchMapp by our students Jake, Mateo & Tomi, where you can virtually scratch off all the places around the world that you have visited. Other students' projects were: eVenture - find the best venue for your event, CGPS - an electricity coverage map, Collaborate - a task management app, eLearning - educational coding course & Startups Today - social media rankings of various startups. Before our students even started presenting, several inspirational speakers had their speeches. Bogdan Popescu from Roivenue talked, among many other things, about his company and said: "We challenge each other intelectually and value freedom & trust." On the topic of coding, Miloš Broulík from Barclays told the audience: "Coding is a skill, not a knowledge. You have to practise it." When it comes to the right way to approach a new job, Martin Macháček from Inventi had a simple, yet powerful piece of advice: "Always ask. It shows that you care. And the most important thing: be yourself." Coding Bootcamp Praha's Alumni student from Batch #6, Tim Breeding, spoke about his experience after the bootcamp and our lead instructor Jan Polák revealed his personal journey to mentoring. He stated: "Mentoring forces you to learn how things really work on the inside." After the main program ended, drinks and pizza were served to all of our guests so the atmosphere got even better! To see all the photos from the event, check out our photo gallery on Facebook HERE. Make sure to watch quick recap video from the evening & subscribe to our YouTube channel as well!